Hello my friends and welcome to new visitors! In my State it goes from 94 degrees to 40 degrees in 2 days. From hot summer air to cold wet and rain showers! The weather here is unpredictable and the cold weather is here early. They say we will be back into the 80's next week, yeah! I found a older Tilda stamp with a sunflower and made a easel card with her. I miss my sunflowers that would pop up in the garden, they are so beautiful this time of the year. Looking down at the card it is open and the bottom of the easel card has apples and flowers holding it up. I used Maja Papers Walking in the Forest, in the back is a envelope I cut out and folded. There is a special message inside. I have some Magnolia Doohickeys on my card with Petaloo flowers. Thank you for stopping by today! I appreciate your supportive comments. I adore this card, Kelly! Love the colors and especially your coloring of Tilda! So cute and such awesome details!!!!!! Those fall colors always appeal to me. What a beauty!!! I love the fall colors and your fabulous design. Tilda is gorgeous!!! It's good to see you crafting again. Hope you have a fantastic time with your family this week. I love this Kelly. Love the image and so much gorgeousness with the design, layers and embellishments. . Stunning. Ahhhh - I remember this stamp! 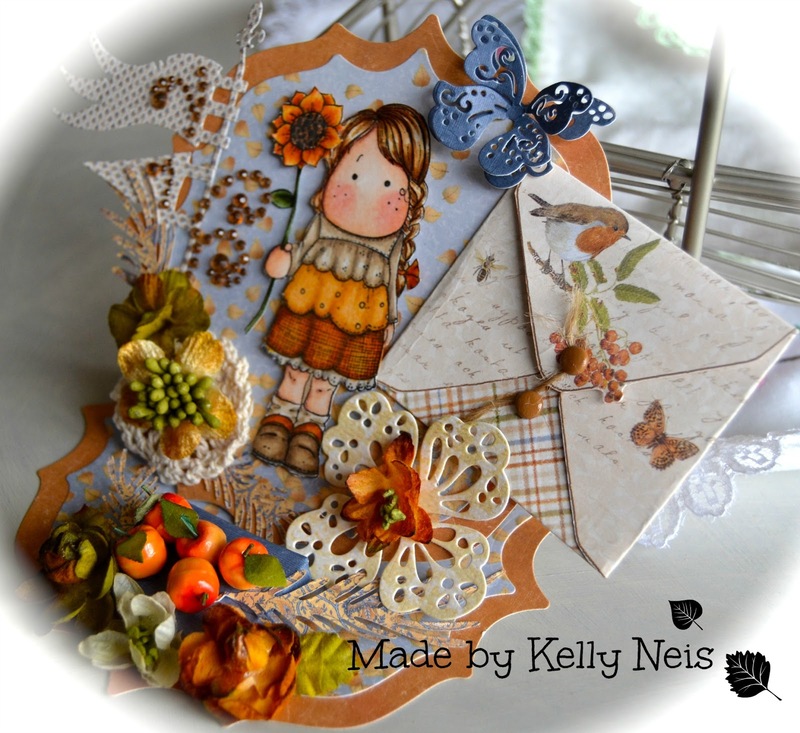 Really pretty card with gorgeous autumn colors. You are not the only one who moves - I think we are too! Gorgeous card! Love the fall colors. Another beauty. Gorgeous card Kelly and the sunflower is spectacular! Love your layering style... so pretty and not all of us can pull it off but you do it in spades! What a pretty card! I personally struggle with the multi-media thing, but you have absolutely rocked it. And, your coloring is amazing! So glad you found us at Words 2 Scrap By. Thanks for joining us for our September challenge! Beautiful coloring job!! Love the detail in your creation! Thanks for entering your card at Words2ScrapBy.blogspot.com!!! Adorable card, but can I ask a silly question? What do you do with a card such as this? Do you attach it to a top of a gift, hand deliver it or what? It's clear it won't go through the mail, but it would be a shame for someone not to receive such a beautiful card. I shy away from lots of embellies on my cards just because I need some ideas on how to get them in the right hands.